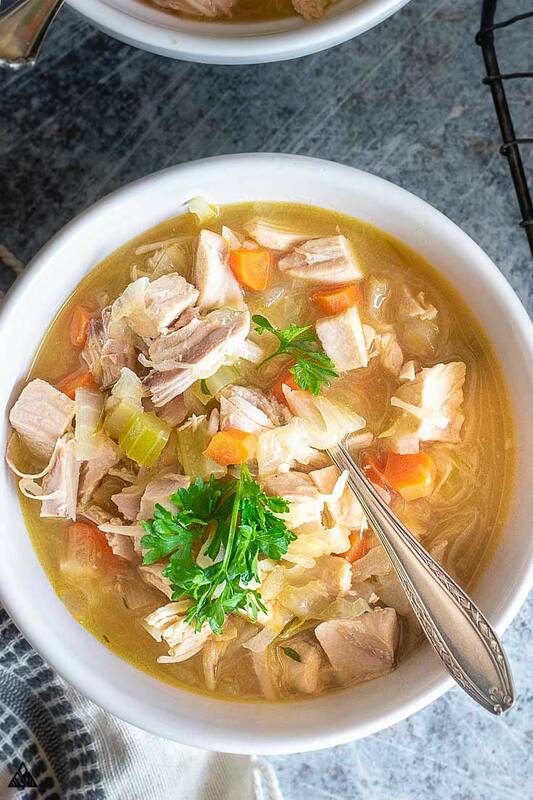 The Best Low Carb Chicken Soup — Soothing and SUPER Delicious! Who the heck needs noodles when you’ve got low carb chicken soup? Because low carb chicken soup is good for the soul 🙂 It’ll warm you from the inside out, and somehow making you feel overwhelmingly cozy. It’s the perfect way to use leftover chicken and veggies, or get creative and find new favorites. 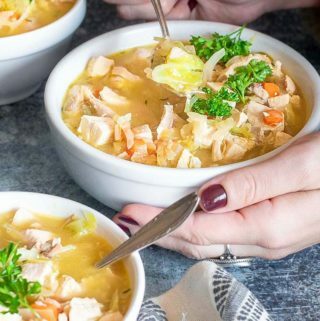 Great for meal prep and busy work nights — this low carb chicken soup takes only 30 minutes to make, and I know you’re going to love it! Sautéing low carb chicken soup vegetables before adding broth. I know sautéing the low carb vegetables may seem like a skippable step, but you’ll be thankful you did it. 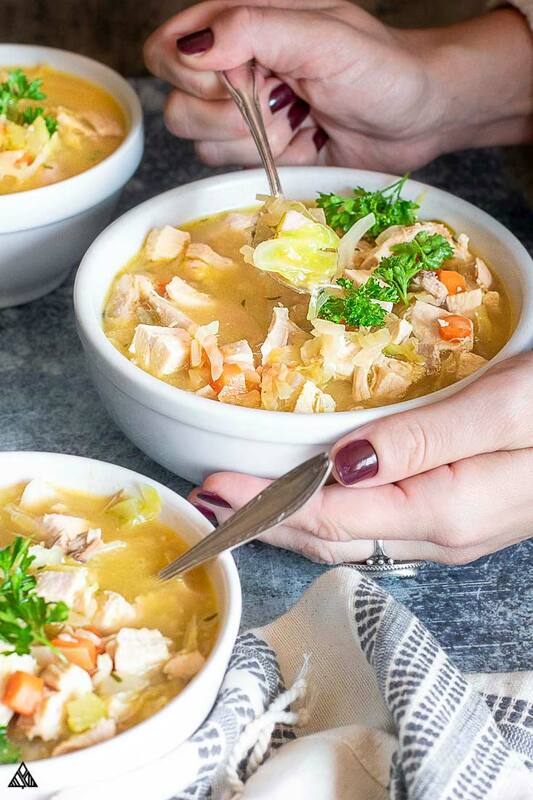 Cooking aromatic veggies (such as onions, garlic and leeks) allows the flavors to become smoother and more integrated with the rest of the low carb chicken soup ingredients — a quick blister goes a long way! Don’t add cabbage to the low carb chicken soup until close to the end! 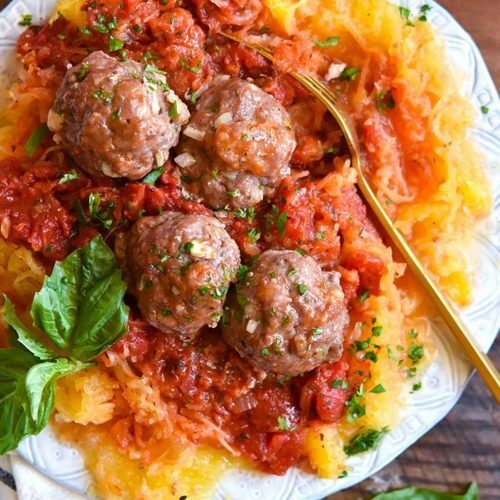 All keto vegetables cook at different rates, and throwing the cabbage in too soon can make it super soggy, whereas tossing it in towards the end adds a nice, subtle crunch! I know it can be hard to hover over, and watch your low carb chicken soup while it simmers — which how so many soup recipes get ruined by a vigorous boil. It’s a good practice to keep half an eye on the simmer status of your soup, so your soup doesn’t overcook before you get to enjoy it! I haven’t made this low carb chicken soup slow cooker yet, but if you try it, let me know in the comments below! 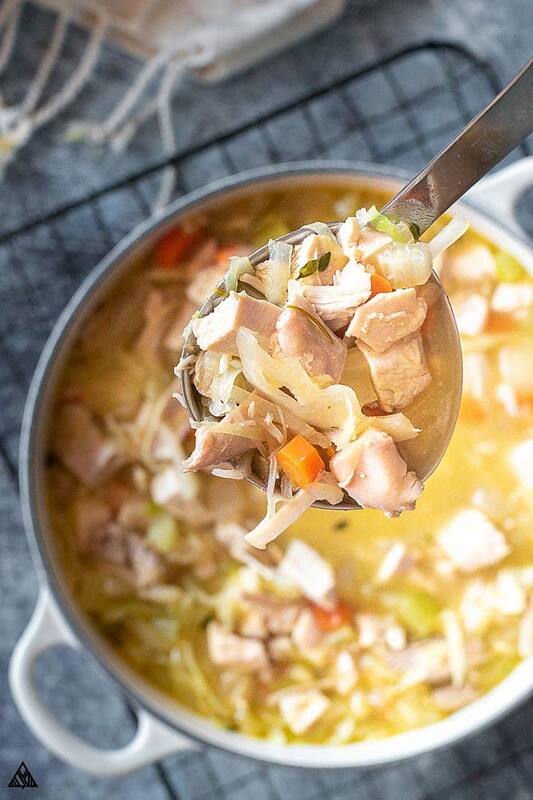 This keto chicken soup recipe is super easy to customize to your personal taste. 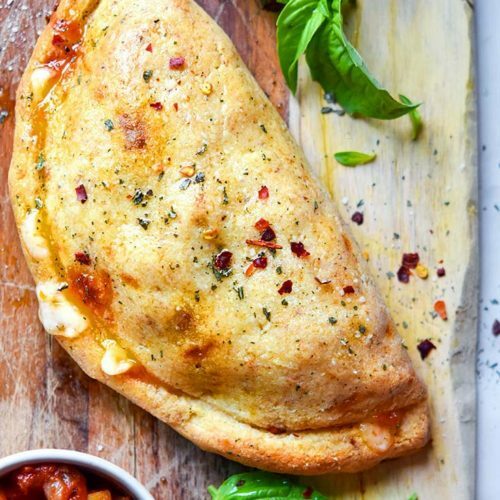 Here are some ingredients you may want to swap, and ideas for what to swap ‘em with! Since I’m sticking to low carb recipes, I use cabbage in lieu of noodles. I find they’re the quickest and most noodle like veggie to toss in. Use any low carb foods you prefer! Zoodles, carrot noodles, squash noodles are delicious in this low carb chicken vegetable soup. Cauliflower rice would be great, as would shirataki noodles, if you can hang with their flavor and consistency! As far and vegetables go, I went for the classic trio in this low carb chicken soup. Adjust them as you see fit! Carrots may be higher in carbs than some of you would like — skip them and add more celery, cabbage, leeks, or whatever you’re craving! I took the lazy approach for this low carb chicken soup by using pre-cooked chicken — half chicken breast and half chicken thighs. I love doing this as a way of using up leftovers or rotisserie chicken. Alternatively, you can boil chicken and shred it specifically for this soup recipe. Or bake it on a sheet, dice it up and add it in! Add your go-to herbs to this low carb chicken soup! I opted for my favorite flavor enhancers — remember to discard the stems and bay leaves before digging in! Turn this into a low carb Mexican chicken soup with fresh salsa, guacamole and low carb tortilla chips on top. Or stir in some sour cream for a low carb creamy chicken soup. Just because you’re on a low carb meal plan, doesn’t mean your low carb soup sides have to be boring! Go for a classic side salad, or make a grilled cheese using a low carb bread recipe. I usually make low carb biscuits and serve them with bacon butter for a special treat. Because I know you won’t want to waste a single drop of this keto soup, I thought I’d share how to freeze this low carb chicken soup for future low carb dinners. Use a large Tupperware container for large portions, and resealable bags for smaller ones. Check out this rad Southern Living video on how to freeze soup! They use an empty cardboard container to keep a plastic bag steady, then ladle the soup in. You can also use a muffin tin for individual portions. 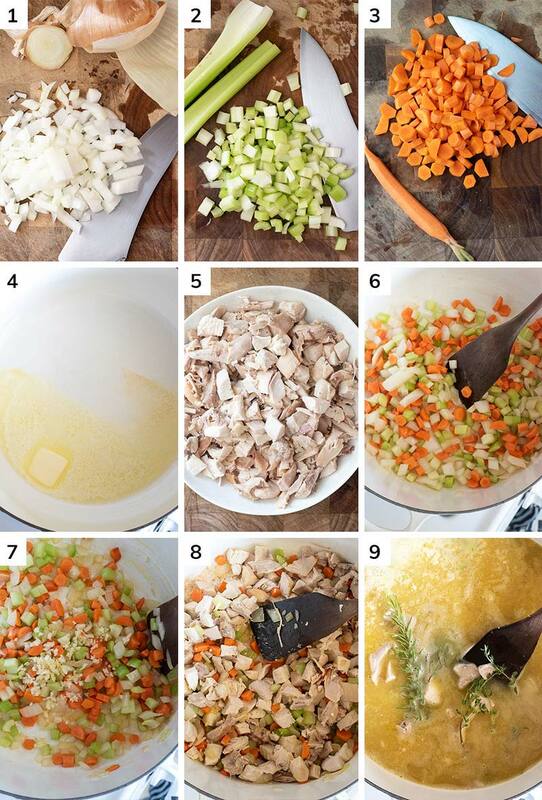 Pst — I love making a double batch of this low carb chicken soup for colds, with the intention of freezing half of it. I’m a happier gal when my freezer is full of low carb meals. Quickly reheat a portion of low carb soups over the stove in a small saucepan. This can be done in the microwave as well. From frozen, you’ll want to defrost your soup in the fridge overnight. Or, if you really want low carb chicken soup and didn’t have time to prep, toss it in a saucepan on super low heat with a dash of chicken broth. Place a lid on top and slowly melt the broth while heating your low carb chicken soup. 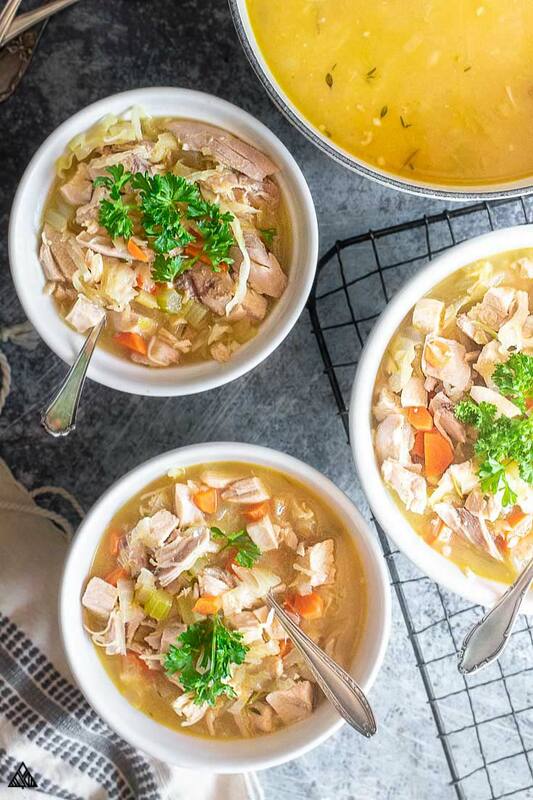 Hope this low carb chicken soup recipes fills your your home with warm and cozy cheer! Let me know what you think in the comments below, enjoy! 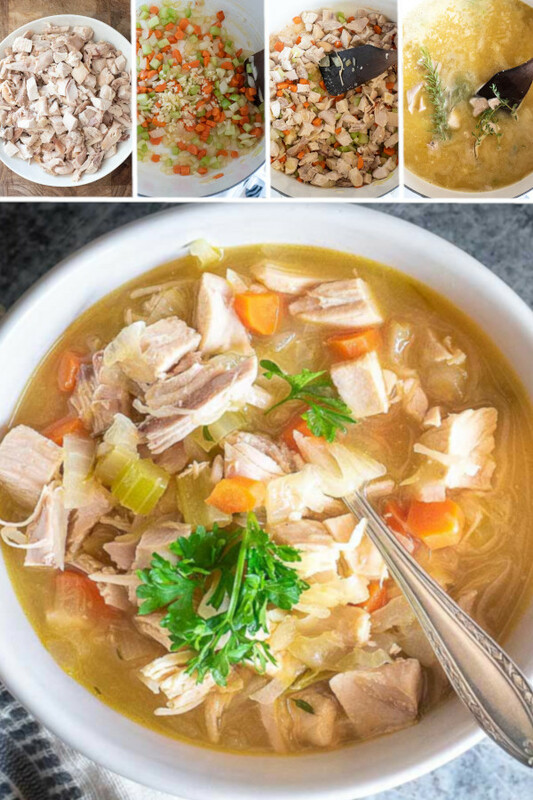 This easy low carb chicken soup recipes here to warm you from the inside out! 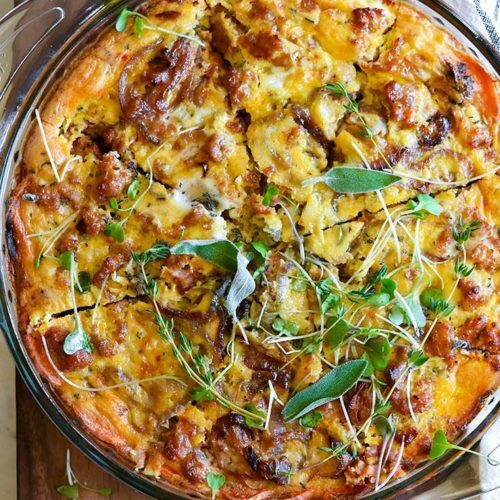 Full of keto veggies, chicken, delicious herbs and takes less than 30 minutes to throw together! Add chopped onions, celery and carrots and cook for about 5 minutes, until veggies begin to soften. Add garlic and cook for 1 minutes, stirring to ensure it doesn't burn. Add cooked chicken and give the ingredients a stir. Add chicken broth, rosemary, thyme and bay leaf. Bring contents to a boil, then reduce heat to a simmer and cook for 10 minutes uncovered. Add shredded cabbage, stir, and cook for an additional 10 minutes. Allow low carb chicken soup to cool and enjoy! Very good. I used a rotisserie chicken from the super market, which are known to be well done. After cooking for another 20 minutes it was some what mushy. Next time I will put it in at the end after the cabbage maybe. Used red cabbage. Gives it a little color.